In the visual world of painting an annunciation is a composition having two poles: the angel and Mary. The annunciations that populate our sacred spaces and illustrate our religious or devotional texts, generally follow a range of representational conventions. The conventions involve the setting, the foreground elements of how Mary and the angel are represented, their positioning in relation to each other, gesture, posture and the background symbols that are used. Senggih’s Annunciation, while echoing some of these conventions, breaks many. In his representation Mary is a discarded 14-inch Madame Alexander ‘composition’ doll. The doll is a found object. It had been put to the side, rejected, then thrown away. Before that it was a manufactured object, put up for sale and given as a gift. We see the doll not in its original clothing, but in a black dress with light colored cuffs and collar sown by the original doll-owner’s mom. The clothed doll has been wrapped in the fragments of an old T-shirt from the artist’s stash of paint rags. A rag, a signal of her low estate. Mary leans in to hear, but backs away. There is a slight cocking of the head toward the voice, a forward bend of the torso at the hips against the backward incline at the pelvis and the legs, a tensive animation in the arms and hands. The ‘annunciation,’ a ‘making known,’ is wordlessly suspended inside a charged section of visual space at the painting’s bottom right — just below the gravitational centre of the work. A line of separation between two spaces falls on the moon-on-sackcloth banner’s left edge. 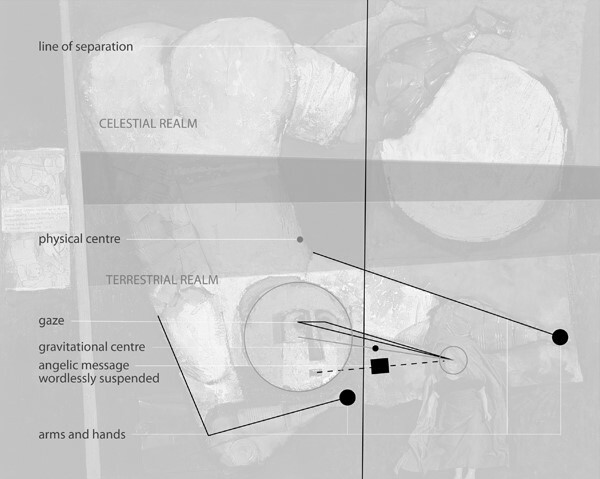 To the left of the line of separation is the tumbling figure’s space; to the right is the doll’s space. The tumbling figure crosses the line of separation above and below the suspended message with its gestures and gaze. There is a focused intensity in the gaze. The gesture of the right arm and hand — an offering gesture — is hesitant. The gesture of the left figure enters deeply into the doll’s visual space, protective, possessive even invasive. The size difference between the angel and Mary is immense. The angel dominates the entire visual space. The effect is one of ‘overshadowing’ (Luke 1:35). The materials contrast. Metal from tin cans makes up the forearms and part of the left leg of the angel. The eyes and nose are taken from the sides and sockets of commercial paint cans. The head is a piece of painted plaster-plate, with the mouth dug out. Papier-mâché hands are extras from a series of puppets. Balloon-like buttocks in dense impasto dematerialize the tumbling figure’s torso and legs into drifting, shifting cloud formations. The angel is real as metal, as substantial as a cloud, dense with substance and reality. On the left edge of the painting, outside the main image area, is a sketchbook page in which the ‘anonymous’ poem is sandwiched between two preliminary images. These show the image’s genesis. We might be inclined to see the first sketch and the text below as, at least in part, autobiographical. The ‘I’ in the text (“and I saw…”) seems to be remembering, envisioning, imagining. The inverted air-borne figure resembles a Chagall-inspired Luftmensch, which in Yiddish means ‘air person’ or ‘human being in the air,’ indicating an impractical person, dreamer or visionary, a person with his head in the clouds. The posture and gesture of this Luftmensch convey an intimate, whispered approach. Between the first and second sketch the image is transformed. It now has become an annunciation. In the second sketch the background setting has begun to disappear. The doll has become Mary, the acrobatic Luftmensch has become an angelic messenger, the whisper has been pulled back almost to a call. In the painting the setting is even more abstract, with just a hint of a horizon separating a celestial from a terrestrial sphere. The moon, “like painted on sackcloth, coming down slowly, a banner lowered solemnly to salute and almost touching the earth,” is now part of a divine gesture tinged with sadness, tenderness and affection. The moon-on-sackcloth and banner form a poignant background motif unprecedented in annunciation history. Through senggih’s inventive use of cast-off material, through the distinctive way he cuts up and fills visual space, through the bold violations of representational conventions, through the introduction of an original and singular background motif, the annunciation is made strange, turned upside down, humorous but also unsettling, gaining new currency, resonant, deep. What begins with an emotionally freighted found object that triggers memory, has become a lyrical, roguish and visionary framing of a gospel event. 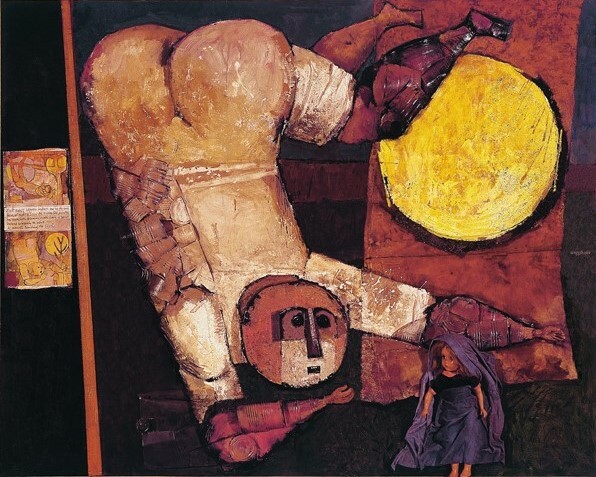 senggih: Annunciation, 1971, 120 x 180 cm, oil on masonite, scrap metal, composition doll, bric à brac, sketch. Annunciation sketchbook page, medium unconfirmed. senggih, pseudonym for Henk (Hendrik Cornelis) Krijger, was born in Karuni on the tiny island of Sumba in the Malaysian archipelago on 19 November, 1914. In 1928 at the age of 14 he travelled to the Netherlands to attend the Gereformeerd Gymnasium in Amsterdam. Between 1932 and 1938 he attended the Instituut voor Kunstnijverheidsonderwijs and the Rijksinstituut tot Opleiding van Tekenleraren in Amsterdam. Krijger’s primary reputation in the Netherlands was as a book designer, illustrator, typographer and type-designer. From 1956 until 1969 he also gained recognition for commissioned work for buildings and in public spaces. In 1969 Krijger migrated to the outskirts of Chicago, Illinois, USA to become Master Artist for the Institute for Christian Art (ICA) — later Patmos Workshop and Gallery (Toronto, Ontario, Canada). Krijger returned to the Netherlands from Canada in 1973. He died September 29, 1979. Peter Enneson (http://www.enneson.com/pedweb_people/pe_main.asp) is a recently retired graphic designer. He holds a Masters of Philosophy in Aesthetics from the Institute for Christian Studies (ICS) in Toronto. Peter has done archival, biographical and cataloguing work on Henk Krijger since 1979. His full-length essay “Senggih’s The Survivors: An Exercise in Artwriting” was published in Pledges of Jubilee: Essays on the Arts and Culture, in Honor of Calvin G. Seerveld, edited by Lambert Zuidervaart and Henry Luttikhuizen. William B. Eerdmans Publishing Company, Grand Rapids, Michigan (USA) 1995. Currently he is helping to establish a Senggih Foundation, to be based in Western Michigan.